Discussion in 'PatsFans.com - Patriots Fan Forum' started by patsfan7983, Feb 12, 2019. Apparently almost all super bowl jerseys are sold out online on either the nflshop or the patriots pro shop (the white jersey with the LIII patch). No Edelman, only XXL Brady. From your experience: Will those jerseys become available again throughout the year once they are in stock, or did I miss the window? Unfortunately I will not be able to visit the proshop at patriot place until october or even next year. Once they sell out they will not make new ones with the LIII patch. Your best bet is ebay. Honestly, those patches are cheap/rubbery. I would stick to a regular jersey without the patch. Just buy em off DHgate. I just bought an Edelman one with a patch for $15, quality is pretty solid but they are prone to mess up a detail or too. Can't beat the price though. After LI I wanted a Brady patch jersey in white. They sold out but they came back about a month later. 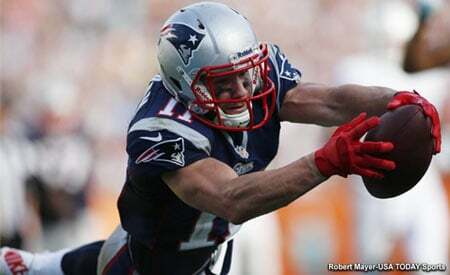 I’m holding out for a white Edelman LIII. Like mentioned above eBay would prolly have it. He's always been my pick for a jersey, embodying everything I like in a player, doing it on un-flashy special teams. After his Edel-embrace asking: "You MVP?" I couldn't ignore him any longer. After failing to get any after 49 and 51 I ordered one from NFL Shop a week before the SB. I got it on the 8th. You can't wait until after the game. After 49 I just bought the patch and had a tailor sew it on on my Brady jersey. It’s a website. They make jerseys probably in China. Pretty much sold out online. They have them on nflshop.ca (Canada) don’t know if they ship to the US but you can try. Also, like patssox mentioned, you can buy the exact patch and hot press it. Takes about 30 days to ship though because it’s coming from China. There’s one on eBay and the seller is from Georgia and they’re selling the same patch for $20 but in the description it says it won’t ship out until the 28th. So he’s obviously waiting for his China shipment to come in and then re ship so you might as well get it for half price. Ballsy move, bro. That one could’ve backfired, miserably. I guess those patches are better than nothing but the official jerseys have the real chrome look patch. They're pricey but glad I finally got the real one. Buy from China. Screw Goodell. If it is, then that aliexpress one looks identical. OR, theres this one which I think is the exact same as the ebay one i just posted except the picture lighting makes it look a lot brighter so it takes away from the details, but I think theyre exact. Ok cool, thanks for the comparison, I was hoping someone had a real one on here to compare them. I’ve been running into the same problem looking for the on the field patch. Unfortunately it looks like that the patches worn on the players jerseys in the game can’t be found anywhere. The patches that the NFL used on the jersey sold in the pro shop are NOT the same as the patches worn in the game. And those are the closest ones that I can find.